In what is one of the most highly anticipated slot translations from land-based casino floors to the online gaming platform, online slot developer WMS Gaming have released the Zeus III slot. 6 Reels and 192 Pay-Lines! 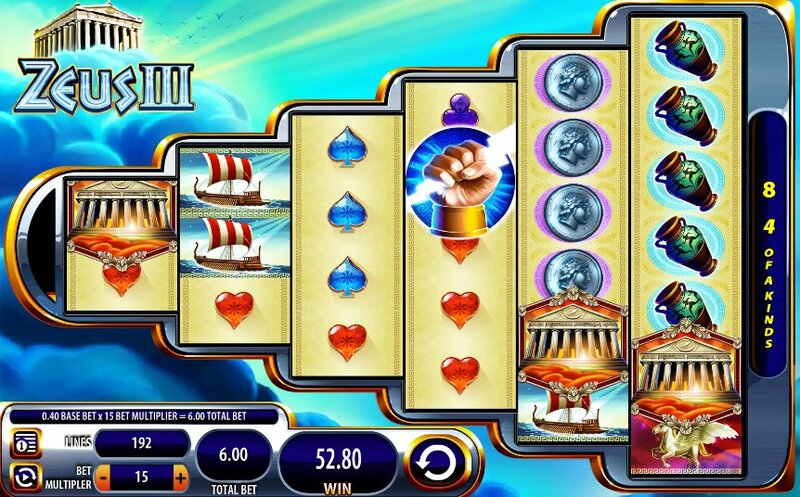 Zeus III has 6 reels and a mouth-watering 192 pay-lines so it is immediately easy to see what all the fuss was about and that’s before we even get to grips with the ins and outs of this Greek mythology-themed slot. It is the first in the WMS Gaming slot to boast the Reel Boost game engine. This allows players to play the slot on a range of platforms with little to zero delay. This opens the game up to any player on any platform meaning that more players than ever before can play a slot with little difficulty. Right, there’s a lot to cover so first things first. The layout of the reels is not exactly conventional. The first reel has two symbols, the second reel has three symbols, the third reel has four symbols and so on until we get to the sixth reel which has seven symbols. Veteran players of the original Zeus slot will recognize the symbols on the reels including a Greek warship, a Greek pot, a Greek coin, Greek army helmet, a pantheon, Zeus holding a lightning and Zeus himself. Keep an Eye Out for Two Wilds! This game comes with two Wilds. Zeus himself acts as the Expanding Wild and he will substitute for all other symbols except for the Scatters to help you complete winning combinations. You will want to keep an eye out for him, especially in the free spins bonus round. The coliseum represents the second Wild so keep an eye out for that symbol as well if you want to hit some big wins on the reels. Speaking of the free spins bonus round, you can win up to a mammoth 50 free spins and earn a 50x multiplier if you hit three or more Zeus holding a lightning bolt symbols. The more of these symbols you hit to trigger the free spins bonus round then the more free spins you will be instantly rewarded. One nice little feature that is also present during the free spins bonus round is that the reels will flip left to right and vice versa in order to increase your chances of hitting some big wins and completing winning combinations. Zeus III is a fantastic addition to the WMS Gaming slots portfolio. 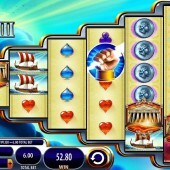 Online players were denied the chance to enjoy a real sequel to Zeus when Zeus II was released as a Facebook slot. Zeus III more than makes up for that heartache and WMS Gaming once again leads the way with producing creative slots. If you got a buzz from previous WMS Gaming slot releases such as the re-release of Jungle Wild and the magical Wizard of Oz – Wicked Riches then you will definitely want to check this out.